Read more below: the prospectus' text follows the pictures. 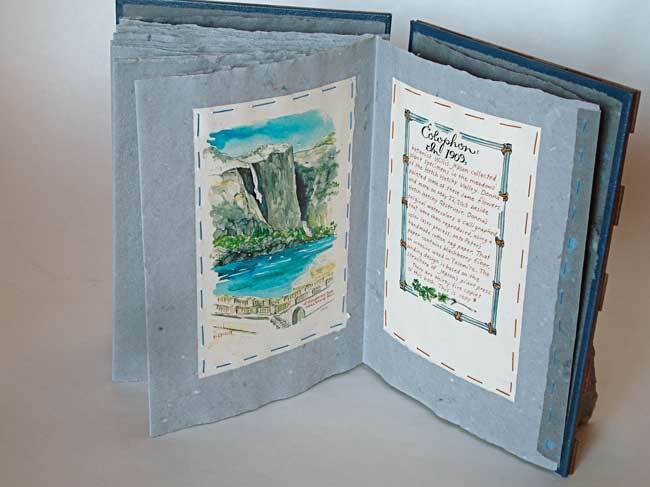 The inspiration for making this book came when we visited the Huntington Library in San Marino, CA in April of 2013. We went to see their special exhibit, �They Were Wild: Recapturing California�s Wildflower Heritage,� which displayed hundreds of drawings and paintings of California�s plants and wildflowers. Donna has spent years painting California wildflowers, and has produced four limited edition books and numerous one-of-a-kind books featuring her illustrations. All those books have been miniature, and all of the illustrations in this show were life size or larger than life. Donna took this as a personal challenge: to make a larger book with actual-sized watercolor paintings of California wildflowers. Donna chose to paint wildflowers in Hetch Hetchy Valley because of the valley�s connection to John Muir and Willis Jepson: both were botanists and both influenced Donna�s interest in botanical painting. Around a hundred years before Donna made her watercolor paintings, John Muir had spent the last days of his life trying (and failing) to stop Hetch Hetchy Valley from being dammed and flooded, and just before the dam flooded the valley, Willis Jepson had collected and identified the flowers growing there. Early in the morning on May 22, 2013 Donna walked from the parking lot of the O�Shaughnessy Dam, following the trail around the reservoir to Wapama Falls. She studied the wildflowers, noting the varieties in bloom and the best specimen to paint. When the light was perfect for painting she walked the return trip, stopping to paint her chosen flowers. Finally she painted a landscape looking back from the dam over the area she had just painted in. 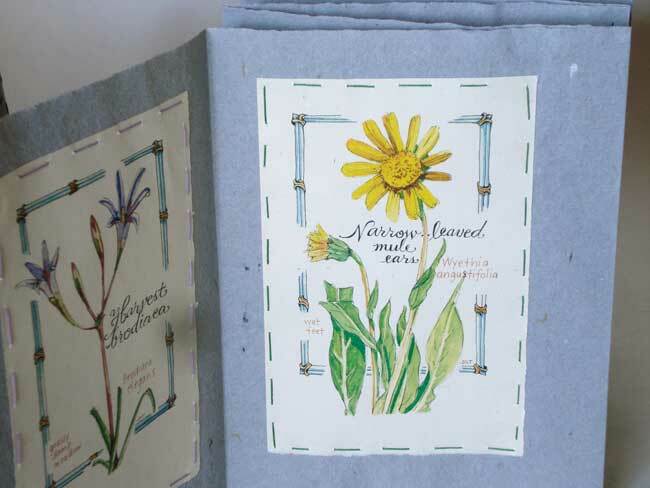 At home, in the studio, Donna used her flora books to make positive identifications of the flowers she had painted. Then she painted the borders on each of the original watercolors, wrote the text and created the original text pages. The 19th century botanists� practice of collecting plants specimens informed the concept for this work. 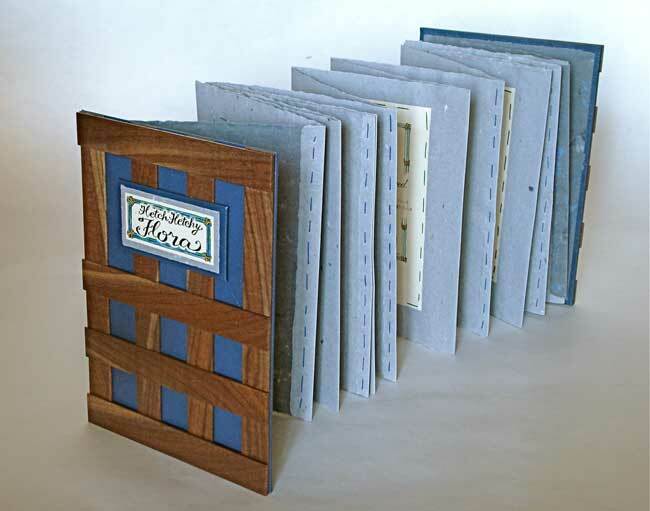 The book is bound as a facsimile of the style of plant press used in Jepson�s day. 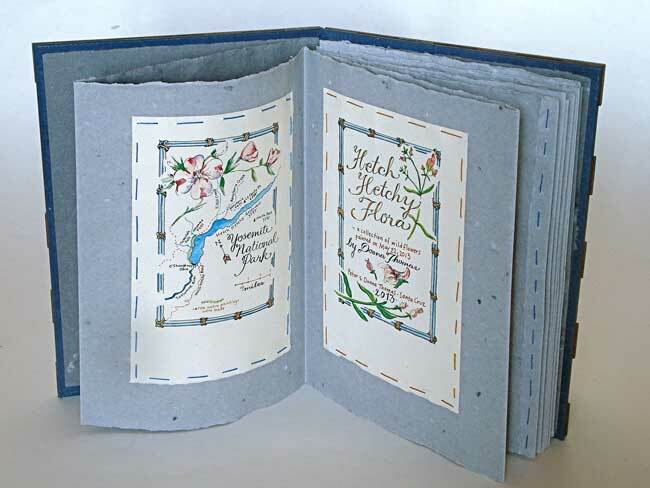 Just as Jepson would have done, Donna collected flowers she found in one place, on one day, but instead of placing actual plant specimens between blotters, she stitched water-color paintings of the flowers to the accordion pages of the book. Peter created a paper for the project that would reference the strawboard blotters of a 19th century plant press and also emulate the feel of the granite walls of the Hetch Hetchy Valley. To do this he had to come up with a method for adding multi-colored flecks of color like those found in granite. He also had to come up with a way to dry the paper that would leave a surface recalling the texture of granite. This was no easy task, given the paper was made using an early 1900s �double mould� that measured 14 by 35 inches. He even had to make a new deckle so the final sheet would have its four rough deckle edges. Peter also made another stronger and slightly different color of granite paper for the end pages, and an off-white sheet of paper to print the illustrations on. Donna�s original watercolors were printed directly onto Peter�s paper using a Cannon digital printer. Those prints were then sewn by hand onto the accordion folded sheets of �granite� paper. The end pages were sewn to the text pages and glued to the covers. 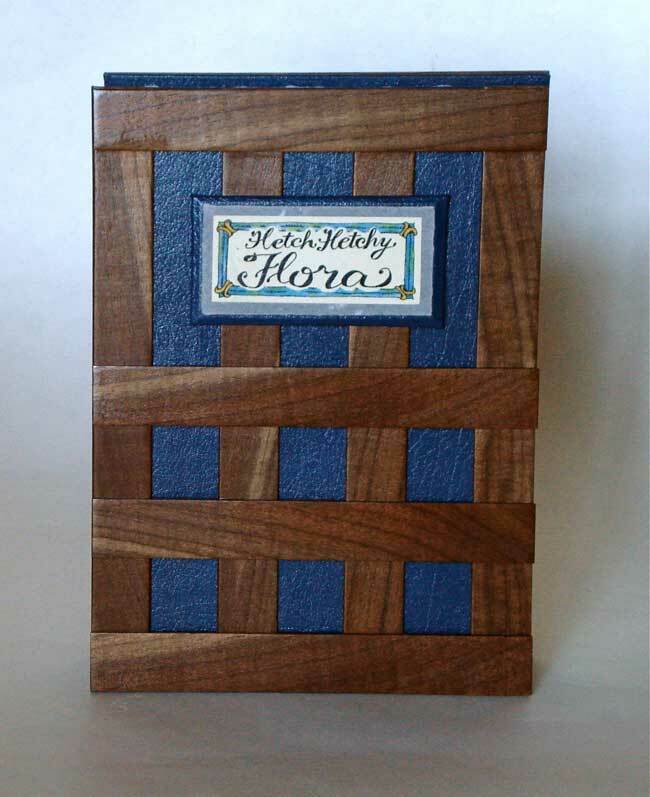 The covers feature a wooden �plant press� over blue Moroccan grain leather-covered boards. This plant press is a lattice of strong hardwoods, modeled after those used in the early 1900s by botanists like Jepson, before the invention of plywood. Several different hardwoods were used in the edition, but most copies are made from walnut acquired from orchards in Stockton, which is located just west of Hetch Hetchy in the San Joaquin Valley. Sadly, and interestingly parallel to what had happened to Muir and Jepson, three months after Donna made her paintings there was a wildfire in Hetch Hetchy Valley, known as the Rim Fire, which scorched the area she had painted in, burning all the vegetation to the ground.